What about if you know the perfect, secret spot in the park, or the rainforest, or at the beach but you're fed up with dragging a train of eskies behind you? Or, say you just want to celebrate in the garden without having to lift a finger. Well, the perfect answer is Señor Paella. 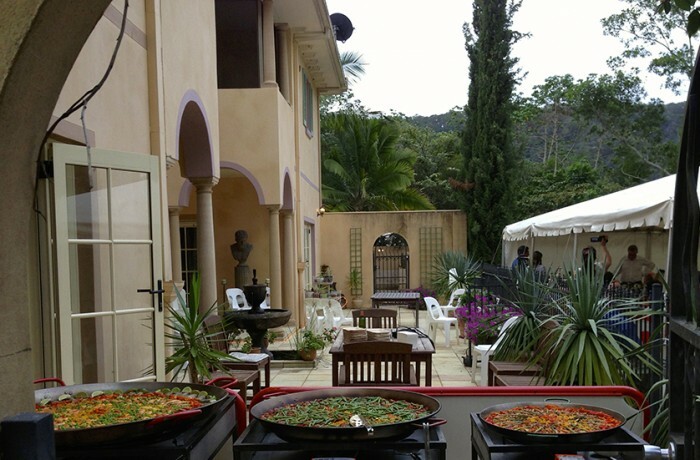 Señor Paella is a unique catering concept that specialises in the delicious Spanish tradition of paella. One of the great things about this fantastic idea is that we prepare, cook and serve our wonderful food on site, from enormous imported Spanish pans, with absolutely no need for any facilities. Specialist catering equipment gives us total independence so that we don't need to step inside your kitchen! And we cater for any type of event all the way from northern NSW, the Gold Coast, Brisbane, Sunshine Coast, Maryborough and beyond! Just think about the possibilities! A wedding banquet in the rainforest, the christening of your block of land in the middle of nowhere, a 40th birthday party in the park where you once played as a child. And all without having to do a thing. And imagine how easy it would be to plan a surprise party; just take the lucky birthday boy or girl out for a quick drink and, by the time you get back, Señor Paella is set up and cooking up a storm! The whole concept of Señor Paella is such a brilliant idea! You really could just let your imagination run wild and book a party for just about any reason, whether it's a private celebration, a big corporate promotional event or a festival. And the food is not just sensational, it's also a terrific spectacle as it's prepared and cooked.